For example – John took a health insurance policy. At the time of taking policy, he was a smoker and he didn’t disclose this fact. He got cancer. Insurance company won’t pay anything as John didn’t reveal the important facts. In case of life or marine insurance, insured must be the owner both at the time of entering of entering into the insurance contract and at the time of accident. For example – Raj has a property worth Rs.5,00,000. He took insurance from Company A worth Rs.3,00,000 and from Company B – Rs.1,00,000. In case of accident, he incurred a loss of Rs.3,00,000 to the property. Raj can claim Rs. Rs.3,00,000 from A but after that he can’t make profit by making a claim from Company B. Now Company A can make a claim from Company B to for proportional loss claim value. After the insured gets the claim money, the insurer steps into the shoes of insured. After making the payment insurance claim, the insurer becomes the owner of subject matter. For example :- Ram took a insurance policy for his Car. In an accident his car totally damaged. Insurer paid the full policy value to insured. Now Ram can’t sell the scrap remained after the scrap. 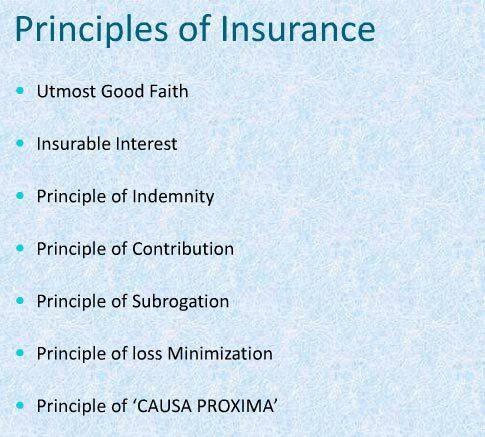 This principle states that the insured must take all the necessary steps to minimize the losses to inured assets. For example – Ram took insurance policy fo his house. In an cylinder blast, his house burnt. He should have called nearest fire station so that the loss could be minimised. An accident may be caused by more than one cause. In case property insured for only one cause. In such case nearest cause of the accident is found out.